In human form the Tarantula was a brilliant athlete with great agility, especially in leaping. He was a superb hand-to-hand combatant. 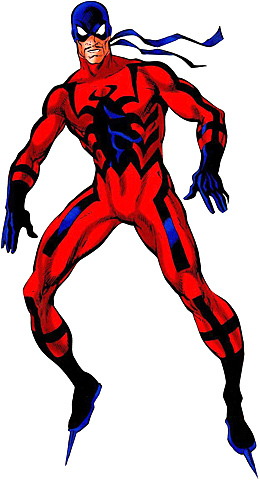 Enhanced Abilities: Tarantula when in his mutated form he had enhanced strength, reflexes and endurance. Poison Blades: Tarantula possesses boots equipped with retractable blades coated with poison. Web Spinning: Tarantula could spin vast webs, whilst mutated. Anton Miguel Rodriguez was a member of a small revolutionary band that opposed the dictatorship of an unidentified South American country. Rodriguez and his associates were terrorists who blew supply trains, kidnapped politicians and held them for ransom, and then killed them if the ransom was not paid. Rodriguez was particularly bloodthirsty, however, and his fellow revolutionaries expelled him from their organization shortly after he murdered a guard without cause during a robbery. Rodriguez then went over to the other side and joined the army of the repressive dictatorship. The government created the costumed identity of the Tarantula for Rodriguez, intending him to serve as their country's counterpart to the United States' Captain America. The Tarantula was sent to hunt down his former revolutionary comrades.